(Roanoke Times edited) A Virginia Tech student launched an effort that as of late Friday had raised more than $34,000 for the wife and family of fallen Virginia Tech police Officer Deriek Crouse. Crouse was remembered Friday by family and friends as a devoted father, a dedicated and unflappable public servant. Virginia Tech senior Bethany Darnley created a Facebook event Thursday night after hearing of Crouse's death and the family he left behind. "It just made my heart melt. I thought that they deserved to have a Christmas just like everyone else," she said. On Friday, she merged her venture with a fund established at National Bank of Blacksburg. All donations to the fund set up by Darnley will be kept by the bank in an account in the name of Crouse's wife. "I thought it was going to be a couple of friends, a couple of hundred dollars max," she said. "This turned to be something much bigger." Darnley had never met Crouse nor spoken with his wife or children. It was unclear Friday how much had been raised in donations made directly to the bank. 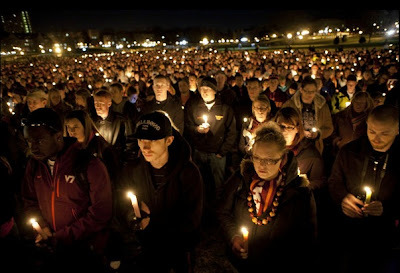 To make a donation online, visit Hokies for Crouse at https://sites.google.com/site/hokiesforcrouse. Whatever Happened to Mike McQueary?